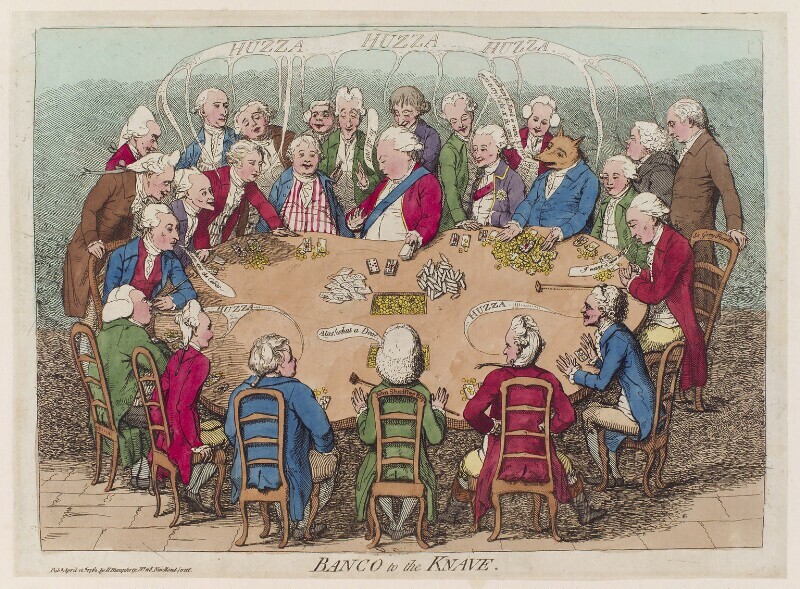 James Gillray (1756-1815), Caricaturist. Artist associated with 881 portraits, Sitter in 7 portraits. Hannah Humphrey (circa 1745-1818), Publisher and printseller. Artist associated with 718 portraits, Sitter in 1 portrait. John Dunning, 1st Baron Ashburton (1731-1783), Solicitor-General. Sitter in 14 portraits. Isaac Barré (1726-1802), Soldier and politician; MP for Wycombe and Calne. Sitter associated with 19 portraits. Edmund Burke (1729-1797), Statesman; orator; author. Sitter associated with 105 portraits. Lord John Cavendish (1732-1796), Politician; MP for several constituencies. Sitter associated with 11 portraits. Sir Grey Cooper (circa 1726-1801), Politician; Secretary to the Treasury. Sitter in 3 portraits. Charles James Fox (1749-1806), Whig statesman. Sitter associated with 306 portraits. Frederick North, 2nd Earl of Guilford (1732-1792), Prime Minister. Sitter associated with 64 portraits. William Petty, 1st Marquess of Lansdowne (1737-1805), Prime Minister and patron of the arts. Sitter associated with 67 portraits. Charles Howard, 11th Duke of Norfolk (1746-1815), Politician; MP for Carlise and Arundel. Sitter associated with 55 portraits. Charles Lennox, 3rd Duke of Richmond and Lennox (1735-1806), Field Marshal, ambassador to France and politician, Secretary of State for the Southern Department. Sitter in 28 portraits. John Robinson (1727-1802), Politician; MP for several constituencies. Sitter associated with 2 portraits. Charles Watson-Wentworth, 2nd Marquess of Rockingham (1730-1782), Prime Minister. Sitter associated with 14 portraits. John Montagu, 4th Earl of Sandwich (1718-1792), First Lord of the Admiralty. Sitter associated with 25 portraits. Edward Thurlow, Baron Thurlow (1731-1806), Lord Chancellor. Sitter in 37 portraits. John Wilkes (1725-1797), Journalist, agitator and politician; MP for Aylesbury and Middlesex. Sitter associated with 49 portraits, Artist associated with 1 portrait. Frederick North, 2nd Earl of Guilford resigns as Prime Minister over recent setbacks in America and is succeeded by Charles Watson-Wentworth, 2nd Marquess of Rockingham who takes office for the second time. Rockingham dies on 1 July and is succeeded by William Petty, 2nd Earl of Shelburne. Repeal of Poynings Law and Declaratory Act of 1720 gives virtual legislative autonomy to Ireland. After a poor reception in the mid 1770s, actress Sarah Siddons makes a triumphant return to the Drury Lane Theatre, London in the title role of Isabella, or, The Fatal Marriage. She will become the century's best known tragic actress. Clergyman and artist William Gilpin publishes Observations on the River Wye; a central text in the formulation of the concept of the picturesque. American War of Independence: Siege of Gibraltar reaches a climax in the Grand Assault but French and Spanish forces are unsuccessful. Britain loses Minorca prompting the Prime Minister, Lord Rockingham, to open peace talks with the Americans. Thomas Grenville is sent to Paris to negotiate with Benjamin Franklin. Paper manufacturer Joseph Montgolfier sends a hot-air balloon 1000 meters into the air, in front of a crowd in the Ardèche in France.